Helicopters were airdropping urgent relief aid Thursday to some of the more than 800,000 people battered by monsoon-spawned flooding in coastal areas of Pakistan, officials said. Many of the stricken were living in higher open areas or atop the roofs of buildings to escape the floodwaters that inundated large areas of Baluchistan province in the wake of Cyclone Yemyin. The army, officials said, had taken over the relief operations, using 14 helicopters to reach stranded villagers. 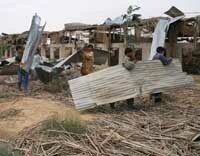 Khubah Bakhsh, the provincial relief commissioner, estimated that some 200,000 houses had been destroyed or damaged. More than 800,000 people have been affected by the floods, caused by heavy rains and spillovers from rivers and dams, he said. The cyclone struck the coastline of Baluchistan Tuesday, killing at least 12 people, said Raziq Bugti, spokesman for the provincial government in an earlier report. Others were believed lost in the Arabian Sea, but no estimates were available. Bakhsh said an accurate, updated death toll was not available given that telephone links to outlying areas had been cut and mobile coverage was not available in others. Navy warships and helicopters have rescued at least 125 crewmen from floundering craft, the navy and Maritime Security Agency said. Aircraft and speedboats were also in demand to help hundreds of people on five isolated islands lying some 150 kilometers (90 miles) southeast of Karachi, said Sami Memon, president of the Fisherfolk Forum, a fishermen's welfare body. "Our house has been washed away. We have nothing left. We are going to live with our relatives 80 kilometers (50 miles) away," said Abdul Qadir, waiting Wednesday with his wife and two children for transport along Baluchistan's coastal highway. Other families also waited nearby. Sections of the highway as well as bridges were washed away, making it hard for homeless people to move and for relief supplies to be delivered. In Larkha, a cluster of villages about 170 kilometers (105 miles) west of Karachi, residents tried to make temporary repairs to all three severed roads into the area, complaining that no outside assistance had yet arrived. Villagers said there was no electricity or food and that water sources had been polluted by the floodwaters, many surging from the Pirgoth River. Many domestic animals, they said, had died and banana orchards were destroyed. "We have suffered total loss. We are going to have to burn all our banana fields," said farmer Noorul Haq. Inland in the mountainous Bolan district, floodwaters burst three small dams, inundating 15 villages and forcing thousands of residents to camp out in the open, local government official Aslam Jamali said. "The water is demolishing their homes, but we had already evacuated them," he said. The army said it had evacuated 4,500 people stranded at various points along the coast. Located to the east on the same Arabian Sea coastline, Karachi suffered torrential rains and thunderstorms, which killed at least 228 people Saturday. City authorities continued to grapple with electricity shortages caused by power lines that were snapped by falling trees, pylons and billboards.